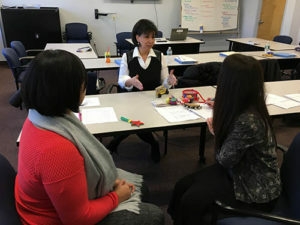 Professional training is essential to ensure successful outcomes for children and families. At Beacon, all treatment staff are required to complete and pass a 30 hour competency-based orientation prior to working with clients, and an additional 12 hours of classroom based training during their first 90 days of employment. In Phase One, the goal of orientation is to establish specific knowledge and physical performance competencies so that new staff can begin to effectively and competently provide services. During this time, therapists are oriented to Beacon’s treatment values, concepts, content knowledge and philosophies. 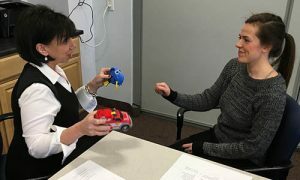 Instruction is provided not only using traditional methods such as power point presentations, but also videotaped models of instructional practices and teaching trials. Oral, written and performance monitoring tests are used to demonstrate the acquisition of skills and to ensure compliance with Beacon’s evidence-based treatment and care goals. This not only provides visual references and context, but also offers examples of common errors and best practice responses. Beacon’s orientation program isn’t rote memorization of facts. 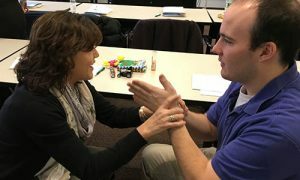 Staff are provided with many opportunities to engage in hands-on physical practice of teaching procedures both with their instructors and with their peers. From preference assessment to prompting and data collection, trainees are able to experience the tasks they will need to execute before heading out into the field. Skills are assessed using a checklist which specifies criteria for competency. Rounding out Phase One of Orientation is online training through the Training on Demand website. Web-based interactive video training serves to both underscore and enhance live training for targeted content and is available 24 hours a day, 7 days a week. The result? Competent, confident staff that are knowledgeable, skilled and supported to work with children on the autism spectrum and their families. However this is only the first half of the extensive onboarding trainings our employees benefit from. We will be posting our Phase Two article soon! Want to be a part of the Beacon ABA Services team? Visit us on the web at https://www.beaconservices.org/careers/ to apply!